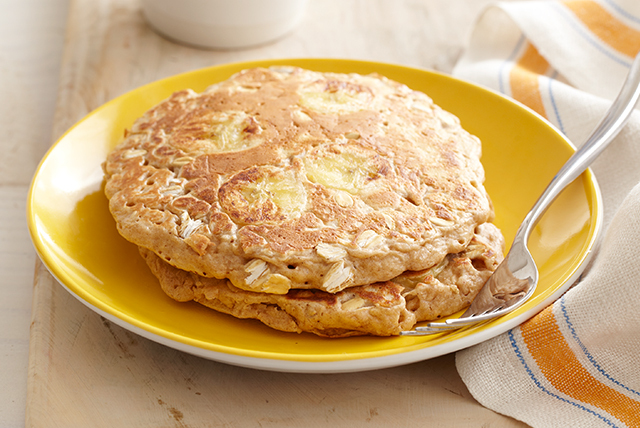 Served warm from the skillet, these homemade oatmeal-banana pancakes are a breakfast delight. Whisk all ingredients except bananas in medium bowl until well blended. Stir in bananas. Ladle batter onto hot griddle or into hot skillet sprayed with cooking spray, using 1/4 cup batter for each pancake. Cook on medium heat until bubbles begin to form on tops, then turn to brown other sides. Serve with no-sugar-added pancake syrup.